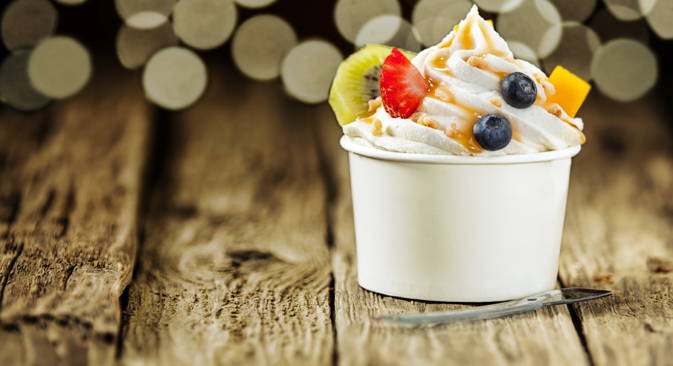 Businessmen across Russia are opening franchises selling frozen yogurt products, inspired by their popularity abroad. The strategies are different: Moscow's Tutti Frutti acquired the franchise from America, while Yogumi from Krasnodar developed its equipment and recipe by itself. The international craze for low-calorie products has now poured into the ice cream market: More than 50 frozen yogurt cafes have recently opened in Russia, following a craze that originates from the United States. "I prefer the classical type - cream or vanilla yogurt with fruit or berries," says founder of the Russian Tutti Frutti café chain Vladimir Raikh. In 2012 he and his wife Tatyana bought a franchising license from the American Tutti Frutti Frozen Yogurt company, which at the time managed yogurt bars in more than 45 countries. An IndexBox survey estimates that frozen yogurt sales increased by six times in Russia in 2013, by about 1.4 billion rubles (about $40 million). But in 2014, according to IndexBox analyst Roman Alferov, the food embargo EU and U.S. imports will negatively affect the growth of yogurt sales. "Almost all the large cafes import the yogurt powder from the U.S.," says Alferov. "After the ban on the import of dairy products the yogurt cafes have to look for domestic suppliers, which will be difficult. The big factories are not very willing to work with small orders, while farmers cannot guarantee the stability of supplies." Raikh had previously worked as an engineer-programmer and employee at a construction firm. He had wanted to start a restaurant business a long time ago and the idea of selling frozen yogurt seemed interesting. The Raikhs liked Tutti Frutti for its abundance of flavors (currently there are 90) and its unusual recipes (for example, there are ingredients such as kidney beans and mint chocolate). The master franchise was rather expensive. Raikh does not reveal exactly how much it cost, saying only that the fee was somewhere between $100,000 and $1 million. The company operates in the mid-price segment: The average customer order comes to $8-10. The first Tutti Frutti parlor opened in Moscow in December 2012 in one of the city’s shopping malls. Now Tutti Frutti has six parlors in Moscow and 18 sub-franchisees all over Russia. Regional partners pay the Raikhs a franchise fee of $25,000 and 4 percent royalties on their revenues, and in return they are provided with the Tutti Frutti technology and recipes. The yogurt, prepared with special machines that the Raikhs import from the U.S., is made with a particular powdered yogurt ferment, also supplied by the brand's owner, which is mixed with milk and is then whipped with a mixer. The franchisees must provide the fruit, berries, sweets and other toppings themselves. The cost of opening a new café (buying the machinery for preparing the soft yogurt paste, decorating the shop window and the premises themselves) is $120-$215,000, depending on whether the owner wants to open a little ‘island’ in a shopping center or a separate café with a customer capacity of 30-40 people. The Raikhs have a quality control team that works with their partner cafes. They also purchase advertising space on radio programs and in newspapers. In the two years it has been operational, Tutti Frutti's general franchisees have attracted about $2.5 million in private investments, which include family friends and bank credit. The business started yielding profit only in June this year. Now the Raikhs earn about $1-1.2 million a month, but reinvest the profits in new cafes. "This is a rather complex business, yet earnings from a yogurt café can be similar to those of a good restaurant: $3,900 - $7,200 a day," says Raikh. The Raikhs’ main competitor is Alexander Zimin, the creator of the Yogumi chain of booths selling lemonades and milkshakes (the head office in Krasnodar manages 25 cafes in the country). He learned to make frozen yogurt by himself. In 2010 Zimin noticed the growing popularity of yogurt abroad and decided to add a new product to his selection. Semi-finished goods from American and Korean producers did not suit him, so his company developed its own low-calorie yogurt-based frozen product, using suppliers in Italy. Yogumi's engineers specially adapted its machines for the new recipes - the chain now even sells advanced freezers under its own brand. Yogumi's first yogurt bar was opened in one of Krasnodar's shopping malls in 2011. Then the entrepreneur decided to concentrate on consulting. For $2,500 Zimin would sell his recipes, explain how to use the necessary equipment and help find the suppliers. Zimin's team helped establish 10 different bars with his consulting-partnership method. Then Yogumi entered the national market with a franchising plan: the franchise fee for the license is 100-150,000 rubles ($2,400 - $3,600) and the overall investment in the café is 700,000 - 1.5 million rubles ($17,000 - $36,000). Zimin promises payoff in three to six months and monthly revenues of 120-250,000 rubles ($2,900 - $6,000). A customer's average order (including coffee, milkshake and lemonade) is between 150 to 220 rubles ($3.6 - $5). "Yogurt bars are an empty market niche in most Russian cities," says Zimin.